First-year Aaron Moylan hits a devastating ball back towards Whittier’s side. The Kingsmen outplayed the Poets 8-1 on Friday, April 12. The California Lutheran University Kingsmen tennis team faced off against the Whittier Poets on Friday, April 12 in a classic Southern California Intercollegiate Athletic Conference match. Coming off a dominant performance against the University of Saint Katherine, the Kingsmen proved to be a formidable opponent against the Poets as they secured the victory 8-1. To start off the day, doubles partners sophomore Isaiah Volk and senior captain Yahn Gawrit set the tone early in the No. 1 spot by winning their match 8-3. “Tennis is a tough sport mentally so you have to make sure you put yourself in the best possible mindset to win,” said Volk, a former Division-I athlete at George Mason University. The second doubles match for the Kingsmen followed with another strong performance, winning the match 8-5 by senior Ransom Braaten and junior Jake Haffner. 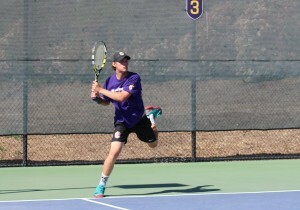 First-years Aaron Moylan and Ryan Murphy for Cal Lutheran could not finish off the doubles sweep as they lost their third match in a nail-biter 8-7. In singles play, the Kingsmen proved to be dominant yet again. 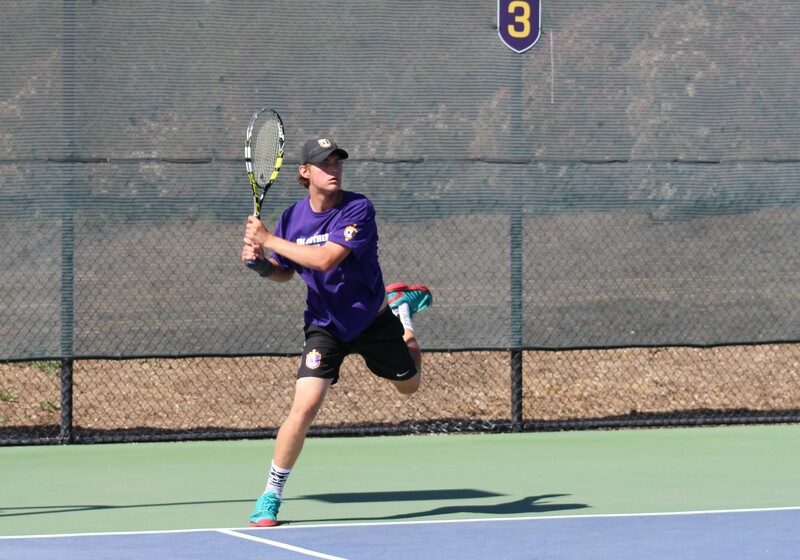 All but one of the singles matches were decided in the first two sets as every Cal Lutheran player took two out of three from the Poets, except for Volk. Volk took his opponent to a tiebreaker that resulted in a 10-6 victory. Gawrit attributed some of the team’s success this season to the team chemistry they have on the court. “Our team this year is really like a family as opposed to last year and we are all willing to work toward our goals,” Gawrit said. Cal Lutheran is now on a three-game winning streak after securing another impressive 9-0 win April 13 over the University of Saint Katherine in San Diego. The Kingsmen are now 12-6 overall and No. 5 in SCIAC standings. Assistant Coach Leo Palesi said he believes the Kingsmen have not reached full potential yet, but knows they have what it takes to get to the next level. “I think we are not at our best level yet, but we are better than the first couple of weeks of the season. We had some injuries that cost us some matches, but now, with the full line-up, we are looking much better,” Palesi said. The Kingsmen look to keep up the momentum in the second to last regular match of the season at Chapman University April 19.